Flow Technology excelled at innovation, integrating high-pressure water jet technology into powerful tools that cut automotive glass and airplane composites and clean ships' hulls and roadways. But, for all their technological expertise, Flow Technology's own IT infrastructure was overly complex, fragmented, and outdated. Read how Flow deployed Dell hardware across the enterprise, enabling their IT staff to spend less time fixing problems and more time working directly on products and ideas that benefit the business. 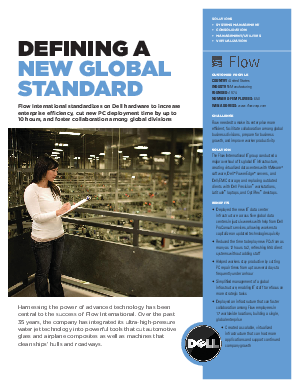 Now standardized on Dell Hardware, Flow Technology has increased efficiency, drastically reduced new PC deployment time, and fostered collaboration among global divisions.